Many British celebrities left the UK in the late sixties and seventies to avoid paying high taxes. The driving force was a huge 95% tax rate for the new millionaires that were emerging in the country. Yom Kippur is the holiest day of the year for the Jewish people and is also known as the Day of Atonement. A “buff”, “fiend” or a “nut” is one who is extremely enthusiastic and knowledgeable about a subject. “Penny Dreadful” is a horror TV show that started airing on Showtime in 2014. I don’t do horror, so I haven’t seen the show, despite the fact that it is filmed in Dublin. Characters in the show come from 19th-century fiction from Ireland and Britain, including Oscar Wilde’s Dorian Gray, Bram Stoker’s Abraham Van Helsing and Mary Shelley’s Victor Frankenstein. Changdeok Palace in Seoul, South Korea was the home of Sunjong, Korea’s last emperor, until his death in 1926. The palace is also known as “Changdeokgung”, which translates literally as “Prospering Virtue Palace”. The white tiger is a Bengal tiger that is missing the pigments that produce the usual orange color due to a genetic mutation. The mutation is a rare one, and the probability of it occurring increase with inbreeding. The inbreeding can cause genetic defects, such as crossed-eyes, a crooked backbone and kidney problems. The famous “Left Bank” (“La Rive Gauche”) of the River Seine in Paris is the river’s southern bank. The area south of the river was traditionally quite bohemian and was home to artists, students and intellectuals. Otto Hahn was a German chemist, someone who vigorously opposed the anti-Jewish policies of Nazi Germany. Hahn was one of a small group of scientists who discovered nuclear fission, pointing out that uranium atoms could be split into barium atoms when bombarded with neutrons. Hahn was awarded the Nobel Prize in Chemistry in 1944 for this discovery, although he probably got the credit for work that was actually shared with others. The Battle of Thermopylae took place in 480 BC, fought between the Persian Empire of Xerxes and an alliance of Greek city-states led by Sparta. The Greeks chose the narrow pass of Thermopylae to make a stand against the advancing Persian army, as there they could minimize the advantage that the Persians had with their large army. The pass of Thermopylae was so narrow that only one chariot could pass through at a time. Famously, the vastly outnumbered Spartan forces (the “300”) held this pass with hand-to-hand combat for two full days, until a local resident showed the Persians a way around the pass so that the Greek army could be attacked and annihilated from the rear. “Tec” is a slang term for a private detective, a private investigator (PI). “Ungulates” are hoofed animals. “Ungulate” comes from the Latin “ungula” meaning “hoof” or “claw”, which in turn comes from “unguis” meaning “nail”. Michael Keaton is an actor from Coraopolis, Pennsylvania. Keaton is perhaps best remembered for roles he played in Tim Burton films. Keaton had the title role in “Beetlejuice” in 1988, and the title role in “Batman” in 1989 and “Batman Returns” in 1992. The city of Lincoln is the second-largest in Nebraska, and is the state capital. In the days of the Nebraska Territory, the capital was the larger city of Omaha. When the territory was being considered for statehood, most of the population (which lived south of the River Platte) was in favor of annexation to Kansas. The pro-statehood legislature voted to move the capital nearer to that population in a move intended to appease those favoring annexation. As this conflict was taking place just after the Civil War, a special interest group in Omaha arranged for the new capital to be named Lincoln, in honor of the recently-assassinated president. The thought was that the populace south of the River Platte had been sympathetic to the Confederate cause and so would not pass the measure to move the capital if the Lincoln name was used. But the measure passed, the capital was moved, and Nebraska became the thirty-seventh State of the Union in 1867. Bora Bora is one of the Society Islands of French Polynesia. The name “Bora Bora” is imitative of the Tahitian name for the island and should really be pronounced “pora pora”. “Bora bora” translates as “first born”. The game of Scrabble has been around since 1938, the invention of an architect named Alfred Mosher Butts. Butts determined how many tiles of each letter, and the point value of each tile, by analyzing letter distributions in publications like “The New York Times”. The Turner Prize is awarded annually by the Tate gallery in the UK to visual artists. The prize is named for the painter J. M. W. Turner. The city in upstate New York called Rochester started off as a tract of land on the Genesee River purchased in 1803 by three army officers from Maryland, including Col. Nathaniel Rochester. Within a few years the land had been developed into the village of Rochesterville, and in 1823 the name was simplified to Rochester. An “exegesis” is a critical interpretation of any text, although the term originally applied to the Bible. A mimeograph (also “mimeo”) is a cheap printing press that applies ink to paper through a stencil wrapped around a rotating drum. Mimeographs are still around, but have largely been replaced by offset printers and photocopiers. “Fútbol” is the Spanish word for football, soccer. A.R. Ammons was a poet who grew up in Whiteville, North Carolina. He won the National Book Award for Poetry on two separate occasions, in 1973 and in 1993. The Anaheim Angels are today more correctly called the Los Angeles Angels of Anaheim (LAA). The “Angels” name dates back to 1961 when the team was founded in the “City of Angels”, Los Angeles. When the franchise moved to Anaheim in 1965 they were known as the California Angels, then the Anaheim Angels, and most recently the Los Angeles Angels at Anaheim. The hit TV show “Sabrina, the Teenage Witch” is based on a comic book series of the same name. The title character is played by actress Melissa Joan Hart. Sabrina lives with her two aunts, Hilda and Zelda, who are both 600 years of age. There’s also a cat called Salem, who has magical powers. An “umlaut” (also “diaeresis”) is a diacritical mark consisting of two horizontal dots placed over a letter, usually a vowel. Here in the West, we are perhaps most familiar with umlauts in German, as in “Schön”. Häagen-Dazs ice cream originated in the Bronx, New York in 1961. The name “Häagen-Dazs” is a “nonsense” term, words chosen for its Scandinavian feel that the producers thought would appeal to potential customers. In William Shakespeare’s play “Hamlet”, Polonius gives some fatherly advice to his son Laertes before the young man heads off to France. Included among the numerous pearls of wisdom is the oft-quoted “Neither a borrower nor a lender be” and “to thine own self be true”. Frangelico is a hazelnut-flavored liqueur from Italy. A Frangelico bottle is very distinctive as it is shaped like a friar, complete with a knotted white cord around the waist. The manufacturers tell us that the liqueur is based on the legend of Fra Angelico, a hermit and monk who made unique liqueurs, hence the shape of the bottle and the name “Frangelico”. There are competing stories about the etymology of the phrase “heard it through the grapevine”, meaning heard it by means of gossip or rumor. One is that it is a reference to the Grapevine Tavern in Greenwich Village, New York City. The Grapevine was a popular meeting place for Union officers and Confederate spies during the Civil War, and so was a great spot for picking up and spreading vital gossip. “John Dough and the Cherub” is a 1906 children’s novel about a gingerbread man (John Dough). In German, “zehn” (ten) minus “neun” (nine) is “eins” (one). Schubert’s famous “Trout Quintet” (more formally “Piano Quintet in A major) is named for an earlier Schubert Lied called “The Trout”, variations of which were used in the fourth movement. The 1906 Hepburn Act augmented the power of the Interstate Commerce Commission (ICC) with regard to the regulation of the railroads. The bill was named for its sponsor, Congressman William Peters Hepburn, who was responding to public outcry at recent rate hikes by the railroad corporations. 13…Sleepy backseat query..ARE WE THERE? The site is only letting me “Leave a Reply” to Dave’s post. I suppose it will come across as a regular post. This was difficult for me. My first look at the puzzle, I felt like I knew nothing.The first answer I guessed was ARE WE THERE. Eventually just the NW did me in. If I had thought of AXON, I might have avoided looking up GENESEE which made the rest of the area fill in rather easily. I never thought of STAGE MOM as an entity. So officially DNF, but 1 lookup and I did finish. This puzzle was Willie’s fault. He predicted a Silkie, but this was just as evil. UNGULATE was new to me and I guessed INBRED although I did not know that about white tigers. Gareth Bain is a veterinarian so I guess he knows such things. You know he would have liked to work in Xerxes into the puzzle, but he had to settle for TAX EXILE as his double X entry. Overall an enjoyable and (for me) challenging puzzle. Hi, all! I do notice that each of the puzzles tend to have their own “personality”, if you will. LAT tends to be the junk baller type of grid (baseball fans will know that reference), and that definitely has a way of getting frustrating (though NYT junk balls too sometimes). For working mainly on other grids the last month or so (more NYT and WSJ, time-wise), I notice it seems to take a little bit different skill-set to do each of them successfully. Anyhow, LAT grids, while easier for me than the others do seem “stranger” as of late since I haven’t been doing them every day and have more of an even comparison. To wit, I’m sure it’s very good to have experience with them all in order to even begin to prepare for something like the ACPT. I have to wonder sometimes what kind of feedback mechanisms the editors have and how seriously they consider them, especially as I understand that they’re all mostly top 10-15 or so ACPT contestants in the past and may not be able to judge difficulty too well sometimes. I know it’s been mentioned that NYT puzzles get circulated in the office before publication, but not sure of the others. I give a fair benefit of the doubt though, as a completely clean grid seems to be incredibly rare (last one I saw being the substitute for the “stoplight” NYT Sunday). As for editors, I’m sure they get their favorite constructors and will feature them as much as they’re willing to create (Zhouqin and Weschler being notable for LAT, others notable for NYT and WSJ too), even if the content isn’t as notably good. 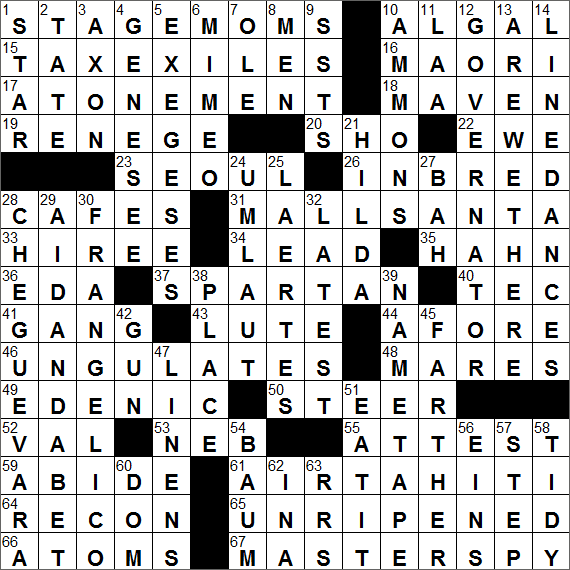 To wit, as Willie noted about a month ago, this definitely seems to be the age of the professional crossword constructor, and makes me wonder how much traction a new setter could get in the marketplace outside of going completely indie (as I notice a few already have). Notably though, I do have a relatively current NYT Silkie sitting on my desk waiting to be done, so a lot of it depends on who submits where too. Anyway, thanks for reading my rambling observations, and I hope someone found them interesting. Of course, I’ll have thoughts on the LAT grids in the next day or two after Sunday. I finished about 90% of this thing, and I’m proud of that, considering the difficulty. I REALLY got jammed up In the NE corner!! For “buff” I of course had NAKED. Finally had to peek for MAVEN and ALGAL. Hey Dave, I knew before I arrived here that you’d finish this…good job, and you’re smarter than I. Was anyone else VEXED by that irritating Lincoln clue??!! I of course put ILL, then remembered it was KEN… except it wasn’t. How about that women’s singles tennis final? Great game. Have a lovely Sunday, all! Okay, there’s a blurry selfie of me, which was my test avatar, but clicking on it leads me to SOMEONE ELSE!!! Whaaat? ?